Closing ceremony of VGTU-CalPoly‘2016 summer school was held last week. 30 students from California together with VGTU students had 5 weeks of intensive learning and cultural activities. CalPoly professor Graham Archer shared his thoughts about the summer school and Lithuanian experience. The last 5 weeks will be long remembered by the students from sunny California. Not only because of heavy rains, first time in Europe, and colorful leisure, but mainly because of the overall VGTU-CalPoly‘2016 summer school experience. The engineering summer school is organized together with California Polytechnic State University (CalPoly) for four years already. 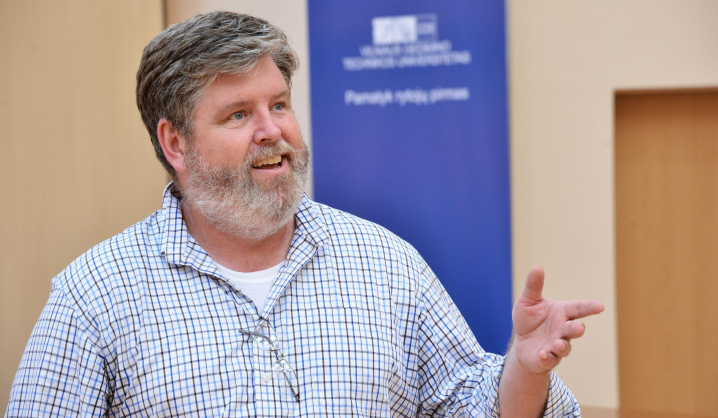 This year VGTU-CalPoly had a new leader – dr. Graham Archer, who was delivering structural mechanics and mathematical modeling seminars at the summer school. We were curious, what memories is the professor bringing home from Vilnius. The summer school is coming to an end. What are your impressions? I love my job, and teaching here was just as in California – I don’t see any major differences. VGTU professors and the university itself impressed me. Students, both from CalPoly and VGTU, are well prepared and seriously interested in the learning materials. Of course, the first week was more complicated for the Americans, especially because some of them arrived to Lithuania 24 hours prior to the lectures. At first I was feeling a bit strange also due to the lack of time for adaptation. Thus, next time I am planning to come much earlier. Traveling for almost a full day is really exhausting. Did you notice any major differences between Lithuanian and American students? Lithuanian students are just like Americans and vise versa. I guess the major difference is their handwriting. All Lithuanian students have their own handwriting style, while Americans prefer writing in capitals. For me personally another big difference was that I had to adapt my teaching material to the metric system. Although, I grew up in Canada, were we were also using the metric system, 35 years ago I came to the USA, and now it was really an interesting experience to come back to metrics again. I took a look at Lithuanian engineering handbooks – though I could only understand schemes and pictures, it was quite clear that we are learning almost the same things in the same order. What do you think are the expectations of American students coming to Lithuania? I think they had no idea what to expect. Although my colleague of Lithuanian descent at CalPoly, Edmundas Saliklis made quite a few presentations about Lithuania and about the VGTU-CalPoly summer school. I came here without an umbrella or raincoat, as did many students. It didn’t rain in California since early March, it happens very rarely there. On the other hand, my first weeks in Lithuania were the hottest in many years. „VGTU-CalPoly‘2016“ schedule is very tight. Every Friday students are having tests, which are not very usual for them, especially when we know that everyone starts learning seriously only a few days prior to exams. We were off for three days to the seaside – it was amazing, but of course impossible to study. Therefore, those few days were off the schedule and we had to work extra hard both in class and at home. Technology Sciences are becoming increasingly prestigious in Lithuania – more students are choosing it every year. How about USA? Is it easy to enter a labor market after the studies? On a national scale, it is not easy to attract young people with sciences, engineering, and math. There are various promotion programs intended to change this situation. However, it’s slightly different at CalPoly. We put up little to no promotion, and this doesn’t stop us from getting great recognition – 1 out of 6 applicants gain entrance to CalPoly. Our students receive many job offers; perhaps this is the reason of the university's popularity. Of course, the requirements are very high for those who want to study technology sciences, and they have to work even harder when at the university. Our students are learning general subjects during the first year, and from the second year specialization modules are added. Due to the statistics, during the first year we have around 25 percent drop out – often it’s because students are choosing easier study programs. During senior years only a few are leaving. I don’t know how it is in Lithuania, but although we strive to nurture young professionals for the state of California, part of them are leaving to other states because of lower living costs. However, we hope that good weather of California shall bring them back (laughing). This is your first time in Lithuania – how do you like it? My first funny experience was taking a trolley bus. I failed to activate the ticket for half of the trip, but fortunately didn’t get fined that time. I like Vilnius and it’s old town very much. I didn’t have any relations to Lithuania so far – I am here thanks to Edmundas Saliklis, my colleague at CalPoly. When I was younger, I couldn’t visit the country due to the historical reasons, therefore I am very happy being able to do it now. Since I live very close to the Cathedral Square now, I did a lot of walking around the old town during the first days. I was very surprised by the cars – many of them were very expensive, some I have never even seen before! I remember thinking that people must be very rich here. But then I visited other parts of the city, and saw more faces of Vilnius. Yes, the dishes are delicious! So far I already have eaten twelve zeppelins. And I fell in love with Lithuanian beer. I have never tasted Lithuanian deep fried garlic bread, but now I know that it’s a great snack. I have noticed, that in Lithuania it is usual to have heavy lunch, while in USA we have heavy dinners. I have no doubts that I will come back to Lithuania next year. The country has left me a very good impression.